Any day that promotes peace should include a peaceful offering at the table. On this most excellent day, when bloggers world wide are writing BlogBlasts for Peace, it struck me that if the entire world could sit down together and enjoy a purposefully mindful and peaceful meal, world peace could be achieved in one evening. Mindful and peacefully prepared, served, and consumed food is a balm for mind and soul, so today, I will prepare Peace and Pappardelle. Please join me and serve a peace-filled meal tonight. 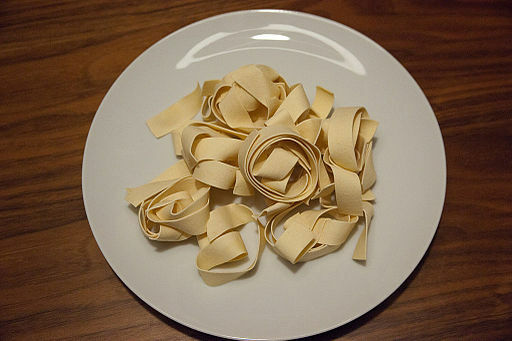 Pappardelle is perfect because its luscious wide ribbons offer a comforting texture with a substantial and satisfying presence on the plate. Fresh tomatoes – carefully peeled and hand crushed (with apologies and thanks to the plant) – will be combined with handfuls of fresh basil and parsley from my garden along with excellent thin ribbons of zucchini, a few cloves of garlic, red pepper flakes, and thin slices of either leek or onion gently sauteed in pure olive oil. The warm mountain of healthy goodness will be liberally sprinkled with freshly grated Parmigiano-Reggiano. When you prep the ingredients first, you won’t find yourself missing a critical ingredient. Make lovely long thin slices of zucchini and place them in a bowl – cut them as thin as you can or use a mandolin (I don’t have a mandolin and will just use my best knife and pay particularly mindful attention so I do not slice me which would not further the peace). Mince the garlic, chop the onion or leek, and prepare the tomatoes. Place all in their very own little bowls. Harvest, rinse, and chop the parsley and basil. I like to leave the basil pieces a little larger than the parsley. These can be mixed together in the same bowl. Save a few whole basil leaves to use as a garnish for each plate. Once you have the ingredient preparation completed, fill a large pot with water and set it to boil – yes I do that separately from the chopping as that removes all pressure and allows me to be mindful as I chop. While waiting for the water to boil, heat the olive oil in a large skillet set over medium heat. When the oil thins and shimmers, add the onions and crushed red pepper flakes. Saute, stirring every once in a while until the onion softens. Add the zucchini and saute another three minutes. Then add the garlic and saute one minute. Add the crushed tomatoes and simmer until the pasta is cooked. When the water comes to a boil, add the pappardelle and boil only just until it is firm to the tooth (al dente) according to package directions. Drain the pasta, add the fresh basil and parsley along with the tomato sauce and toss peacefully. This entry was posted in Musing and tagged blog4peace, I Declare World Peace, peace, Peace Blog, recipe. Bookmark the permalink.